Note: coverage is approximate and will vary depending on the product. Example: large egg rock will cover less area than sand. We sell shredded hardwood bark mulch that is made from 100% tree bark, and not ground up pallet wood. Therefore, it contains substantially more nutrition for your plants and as it decomposes it improves the soil in your gardens. We sell bulk mulch, delivered or picked up. Call or email for pricing/quotes. Hardwood bark mulch is made when the logs of hardwood trees arrive at the saw mill, one of the first things that happens is the logs are put through a de-barking machine and all of bark is removed from the logs before they are cut into lumber. The bark is then shredded up to two or three times. Shredded bark mulch will ‘lock’ and form together, thus, it will stay in your landscaped areas/beds. It is very important to confirm that you are indeed buying mulch that is 100% from hardwood bark. We carry regular topsoil and screened topsoil for your landscaping needs. We sell bulk soil, delivered or picked up. Call or email for pricing/quotes. Topsoil is the layer of dirt with most of the nutrients required for a healthy root base and plant growth. Fruits, vegetables, and flowers need a good layer of topsoil in order to florish. Your soil quality is extremely important to the success of your garden. Topsoil can be used for flowerbeds and vegetable garden beds, as well as for laying turf. 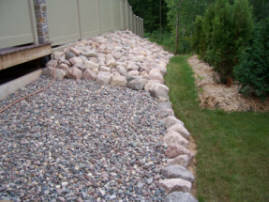 We carry different varieties of bulk decorative landscaping stone and boulders for your landscaping needs. We sell bulk stone, delivered or picked up. Call or email for pricing/quotes. Decorative landscape stone is a durable, lasting, and aesthetically pleasing solution for a variety of landscaping needs. Decorative landscape stone will not fade, discolor or crack, or attract wood pests such as termites and ants. Because decorative stone is a natural product, color and size may vary.